This article describes an interesting and growing in popularity sport- water running.Water running is a great tool for runners for many reasons including those with chronic foot problems or temporary injuries. Although many serious runners usually stear clear from water running, it can be a great way to train while injured and to increase your stamina. Waters running is just what it sounds like, running in water. The weightless effect of water allow your body work through the moitons of running without your body, namely your feet, from having to ber the pressure of your own weight. 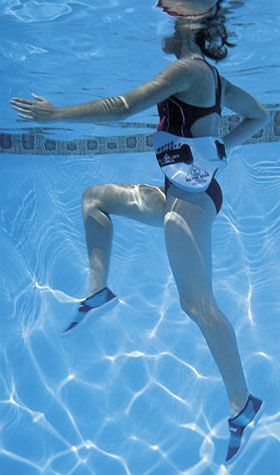 Running and exercising in water are great ways to work your body when you havean injury or soreness. Water running forces your body to use the same muscles as it would during an ordinary run, but it keeps gravity out of the equation. This is especially helpful for people with injuries such as plantar fasciitis (heel pain), tendonitis, and fallen arches. In addition, it allows those with serious, chronic foot problems like achilles tendonitis, arthritis, or plantar fasciitis the chance to be a runner...only it's in water. To learn more about proper running and how to keep your self safe, click here!